In our previous post, we compared and contrasted the standard version of the Trolley Problem with Lon Fuller’s “Case of Speluncean Explorers.” Another possible commonality between both hypotheticals is the legal theory of necessity. Since both cases involve thought experiments that present life-and-death scenarios in which one life must be sacrificed in order to save four or five lives, why can’t the defense of necessity apply to the facts of either scenario? This critical question, in turn, raises a new set of technical and definitional questions. What is necessity? Is it an excuse or justification? And how broadly or narrowly should we define this legal concept (i.e. where do we draw the proverbial line)? In this post, we shall take a different approach to these questions. 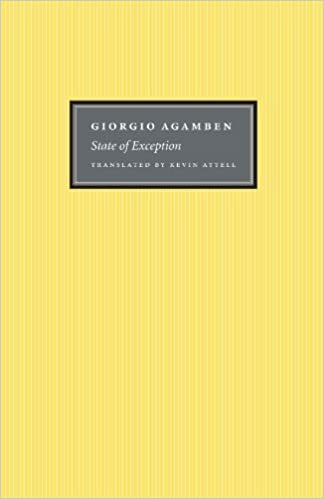 Specifically, building on the work of jurist Giorgio Agamben (whose beautiful book “State of Exception” is pictured below), we shall present three different pictures or theories of the concept of necessity. In brief, we can view necessity narrowly as an ex post exception to violations of law, or in the alternative, we can view necessity broadly as an ex ante independent source of law. Thirdly, we can take an intermediary position and view necessity as an all-around utility player or legal gap filler, i.e. a concept that applies only when our sources of positive law (the law on the books) are silent, conflicting, or otherwise vague and ambiguous. Stay tuned … We will elaborate on all three theories of necessity in our next few blog posts. This entry was posted in Ethics, Law, Uncategorized. Bookmark the permalink.